Examples, solutions and videos to help Grade 4 students learn how to add mixed numbers. The following diagram shows how to add mixed numbers. Scroll down the page for more examples and solutions. Problem 1: Add mixed numbers combining like units. Problem 2: Add mixed numbers when the sum of the fractional units is greater than 1 by combining like units. 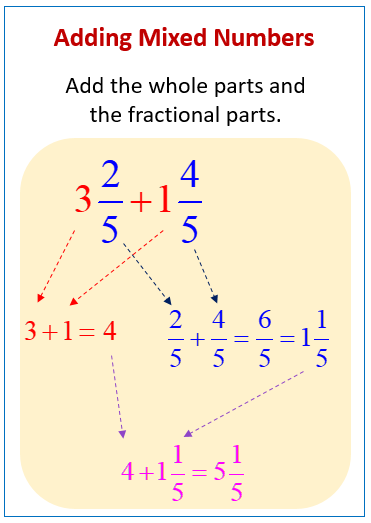 Problem 3: Add mixed numbers when the sum of the fractional units is greater than 1 by making one. 2. Solve. Use a number line to show your work. 3. Solve. Use the arrow way to show how to make one. 4. Solve. Use whichever method you prefer.